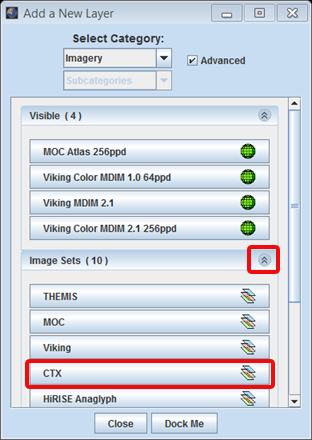 Open the Stamp Layer: Chose "Add New Layer" -> Click the drop-down menu and select "Imagery" -> Make sure "Image sets" is selected and click "CTX". 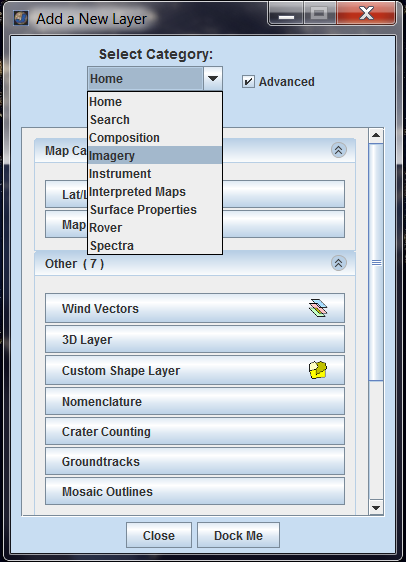 NOTE: A search can be performed with parameters set in multiple categories. Enter Search Parameters: It is not necessary to enter values for each parameter, but the more specific your search the faster it will be. The allowable values for each field are given in the quick reference table below. 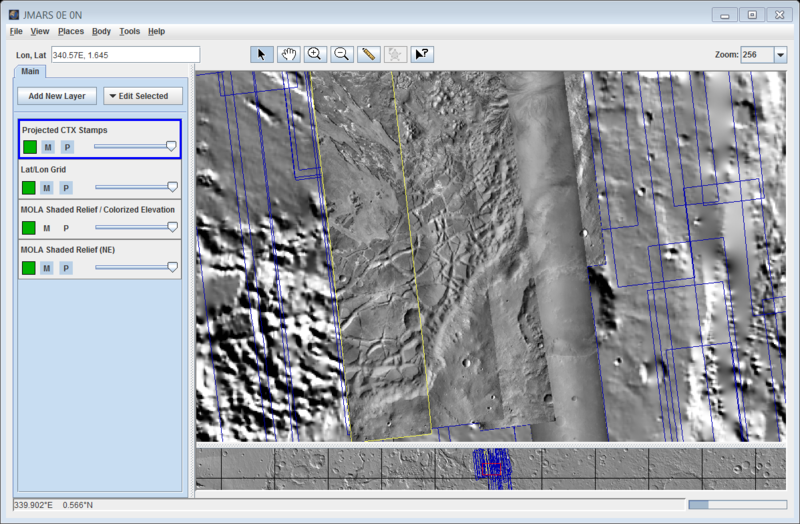 You can also query the stamps for the Mainview only by clicking "Set Lon/Lat to bounds of View". Perform Image Search: Clicking OK will make the Stamp Layer perform the search and display the results. Depending on how specific the search parameters are, it may take the Stamp Layer a few minutes to find and create stamps for all of the images. 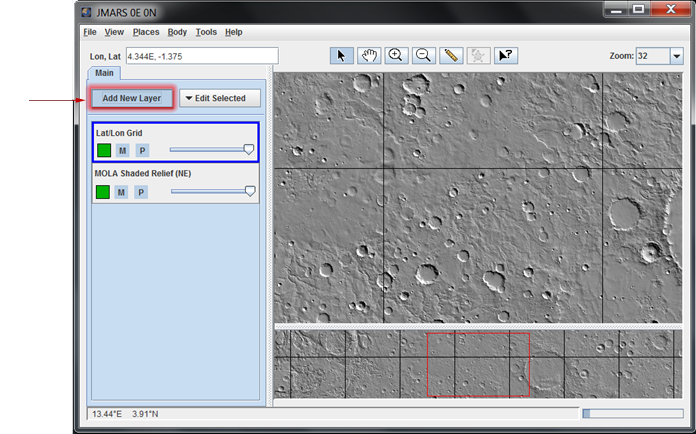 Once the stamps are displayed in the Viewing Window, users can right-click on an outline to either render the image (display the image data in JMARS) or view the image in a web browser. MRO orvit during which the image was acquired. The MRO/CTX mission has been divided into the following phases. Spatial average of NxN pixels of data before downlink; summing=1 implies that no spatial averaging has been applied. This is the image resolution in meters per pixel at the center of the image. The number of horizontal lines of pixels contained in the image. The number of pixels in each line of the image. 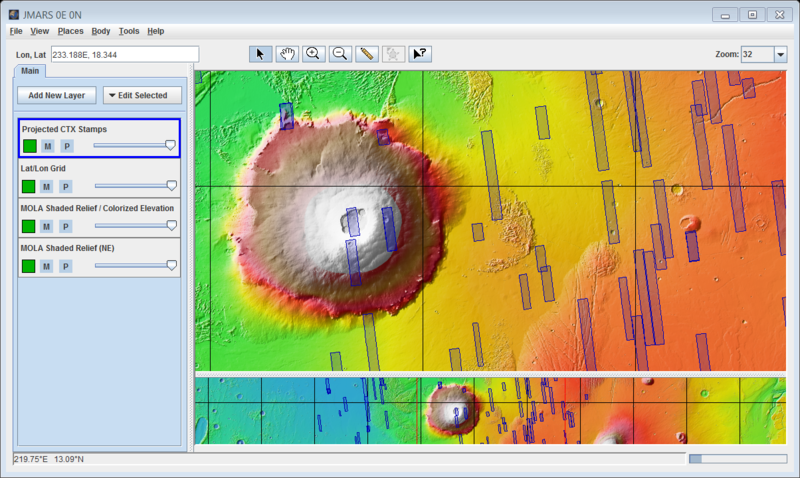 This is the local time on Mars at the center of the image relative to a division of the martian day into 24 equal parts. A martian day is slightly longer than 24 hours and 37 minutes long. This number is similar to the spacecraft altitude, but also takes into account the emission angle. If the emission angle is 0 then this number is the same as the spacecraft altitude. If the emission angle is much greater than 0, then the "slant distance" to the surface at the center of the image is also greater than the spacecraft altitude. A short description of why the image was targeted. 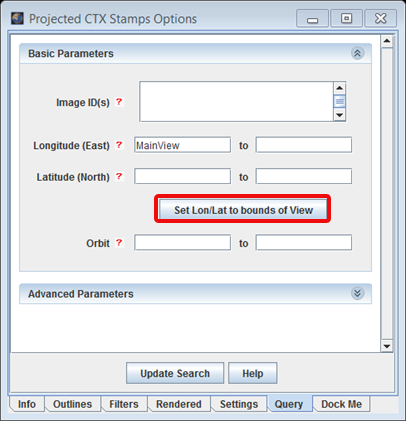 The CTX Camera Stamp Layer's functions are identical to the functions of the Stamp Layer and are explained in detail on the Stamp Layer page.